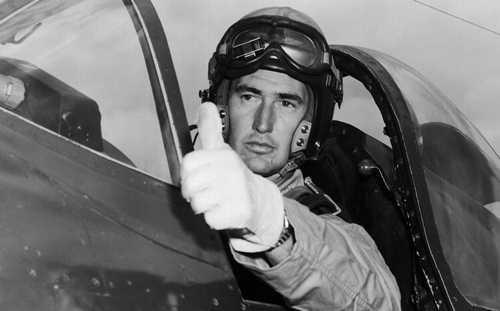 Theodore S. “Ted” Williams was born in San Diego, California on August 30, 1918. Williams played baseball at Herbert Hoover High School in San Diego. After graduation, he was signed by the San Diego Padres of the Pacific Coast League. By the age of 19, he was putting up exceptional numbers with in the American Association with the Minneapolis Millers. Williams joined the Boston Red Sox in 1939 and led the American League in RBIs while finishing fourth in the MVP balloting. In 1941 he hit an incredible .406 making him the first man to hit .400 since Bill Terry in 1930. However, the press and the fans were not happy and he enlisted in the Navy on May 22, 1942. "I'm tickled to death and I'm hoping I'll get into the air quick to start some slugging against the Axis," he told reporters. 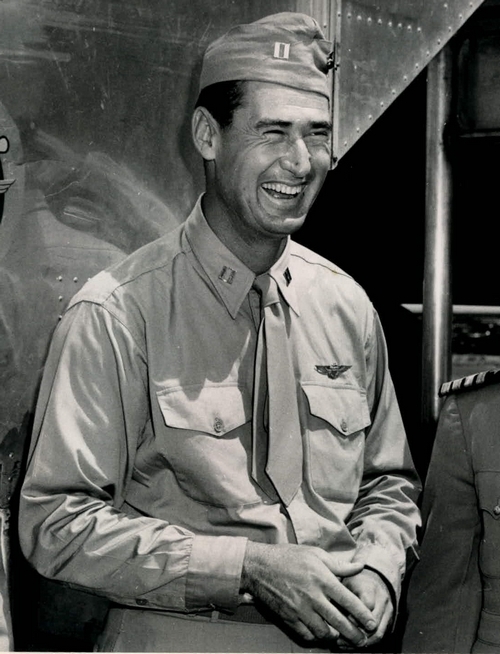 Following the 1942 season, which produced his first Triple Crown (.356, 36 HR, 137 RBIs), he joined the V-5 program with a view to becoming a Naval Aviator. On July 12, 1943, a team of Armed Forces all-stars managed by Babe Ruth and featuring Joe DiMaggio and Ted Williams played the Boston Braves in a fund-raising effort. Babe Ruth, 48 years old, pinch-hit in the 7th inning and flied out to right, but the all-stars won 9-8 on a Ted Williams home run. Then, on July 28, 1943, in a charity game for the Red Cross at Yankee Stadium‚ Babe Ruth lead a team of former Yankees against the Cloudbusters. Johnny Sain walked the Babe in his one plate appearance‚ as the old time Yankees lost‚ 8-5. From September to December 1943, Cadet Williams took primary training at NAS Bunker Hill, Indiana. He then went to NAS Pensacola in Florida for intermediate training where he set records in aerial gunnery. Williams received his pilot’s wings and commission as a second lieutenant in the Marine Corps on May 2, 1944. Williams then attended gunnery training at Jacksonville where he once again set gunnery records. He then returned to Pensacola where he served as an instructor with the United States Marine Corps Reserve at Bronson Field. He played baseball for the base team, the Bronson Bombers, which won the Training Command championship that year. From June to August 1945, Williams went through the Corsair Operational Training Unit at Jacksonville. He was in Hawaii awaiting orders as a replacement pilot and playing ball with a Marine flight-wing team when the war ended. 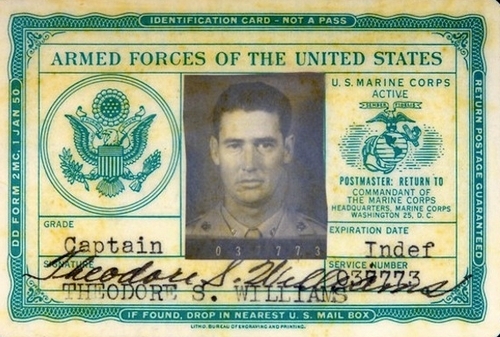 Williams returned to the United States in December and was discharged from the Marines on January 28, 1946. 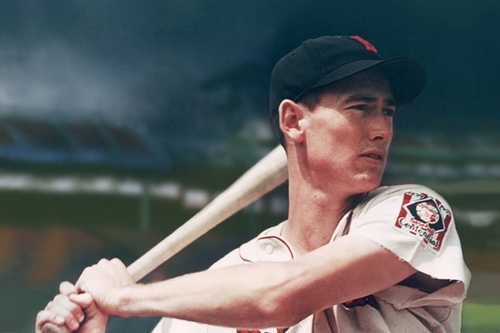 Back with the Red Sox in 1946, Williams hit the first spring training pitch he saw for a home run on February 26 and then led the team to the World Series. He hit two All-Star-Game home runs at Fenway Park and finished the season at .342 with 38 home runs and 123 RBIs, and was named the American League’s Most Valuable Player. 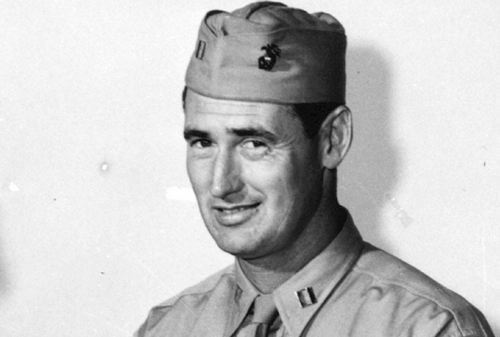 In 1952, at the age of 34, Williams was recalled to active duty for service in the Korean War. After learning to fly the new Grumman F9F Panther at MCAS Cherry Point in North Carolina, he was assigned to VMF-311, Marine Aircraft Group 33 (MAG-33) in Korea. "By luck of the draw, we went to Korea at the same time," said future astronaut, John Glenn. "We were in the same squadron there. What they did at that time, they teamed up a reservist with a regular to fly together most of the time just because the regular Marine pilots normally had more instrument flying experience and things like that. So Ted and I were scheduled together. Ted flew as my wingman on about half the missions he flew in Korea." "Once, he was on fire and had to belly land the plane back in," Glenn said. "He slid it in on the belly. It came up the runway about 1,500 feet before he was able to jump out and run off the wingtip. "Another time he was hit in the wingtip tank when I was flying with him. So he was a very active combat pilot, and he was an excellent pilot and I give him a lot of credit." Williams flew 39 combat missions before being pulled from flight status in June of 1953 after an old ear infection acted up. He returned to baseball after military service and continued to play in the major leagues until 1960. His final at-bat produced his 521st home run. He was elected to the Hall of Fame in 1966, his first year of eligibility. After retirement from play, Williams served as manager of the Washington Senators. His best season as a manager was 1969 when he led the team to an 86-76 record in their only winning season in Washington. Talking about his military service some years later on an episode of ESPN's Major League Baseball Magazine, Williams said "The three years that I lost - hell, there were nine billion guys who contributed a lot more than I did." In his last years Williams suffered from poor health, specifically cardiac problems. He had a pacemaker installed in November 2000, and underwent open-heart surgery in January 2001. After suffering a series of strokes and congestive heart failures, he died of cardiac arrest in Crystal River, Florida, on July 5, 2002.